Braden didn’t decide to intern with Touch A Life for community service hours or a school requirement. Like many others, Braden’s work with Touch A Life in Ghana came from a journey through grief. Braden, age 19, is the oldest brother in the Deal family. His younger brother, Connor, died suddenly at the age of 12, leaving the Deal family broken and searching for meaning. That search led to a connection with Pam and Randy Cope, Touch A Life’s co-founders, and the Connor Creative Arts Center came to life. About eight months after the opening of the Connor Creative Arts Center in Ghana, there was a need for a temporary intern to lead children in art therapy activities and help the healing process while the staff conducts a search for a permanent Art Director. Little did Braden know that his own healing process would so quickly help heal others. Braden has always loved art and creative expression. Growing up, his passions were drawing cartoons and playing music, particularly the guitar, piano and drums. In high school he became interested in film and visual storytelling, and he recently spent some time on a local movie set to see what the film industry is like. 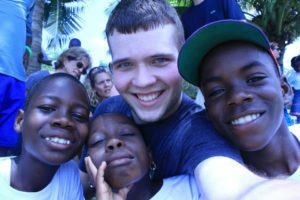 These artistic pursuits are all coming together as Braden travels to Ghana, teaching the children to draw, play instruments, and capture his adventures on video. He has packed a small guitar, a ukulele, percussion instruments, and plenty of art supplies for his trip! We also asked Braden about his previous trip to Ghana for the opening of the Creative Arts Center. He said, “It was surreal. It’s really not tangible until you are there for yourself. I knew this was going to be a great place for art and rehabilitation. You go in the Creative Arts Center and your mind goes crazy with all the possibilities of what it could be used for. It’s colorful and awesome.” With Connor’s love of bright colors, Legos, and helping other kids, Braden thinks the Creative Arts Center has captured his spirit perfectly. In preparation for his time as the Art Center Intern, Braden has rekindled his love of drawing and painting. He is focusing especially on putting himself in a child’s mindset and imagining how different colors can represent emotions. Here at Touch A Life, our team is cheering Braden on during his trip. We are inspired by the legacy he will continue in honor of Connor.